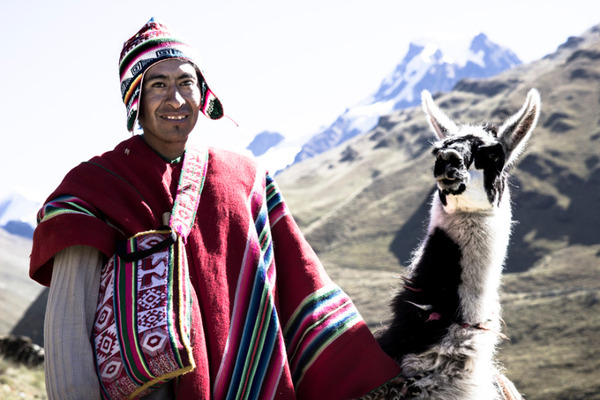 La Paz is located at the crossroads of three very different geological systems: the Altiplano, Lake Titicaca, the majestic Cordillera Real. 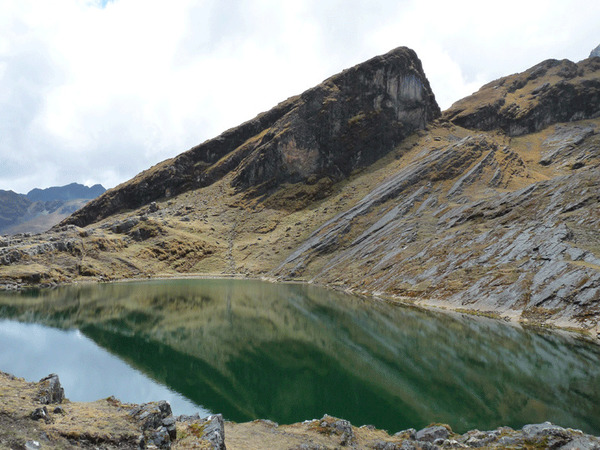 Its summits often peaking at over 6000 meters above sea level and finally the tropical region of the Yungas where grow the famous coca leave as well as all the tropical fruits that supply the capital colorful markets. This outdoor circuit takes us to the discovery of three different atmospheres, using original methods of transports: sailing boat, trek and mountain bike. Pure pleasure! Our private driver will pick us up in the hotel lobby at 09:00 am for a full-day tour around the best points of view over the city and into the Moon Valley. La Paz, world’s highest capital elected in 2014 as one of the New 7 Wonders Cities, is surrounded by the high picks of the Andes. From many parts of the city we can admire the white summits of the Cordillera Real and the imposing Illimani, protector of the city. From the K’Illi K’Illi mirador and the Laykakota Park we will enjoy a panoramic view over the capital. 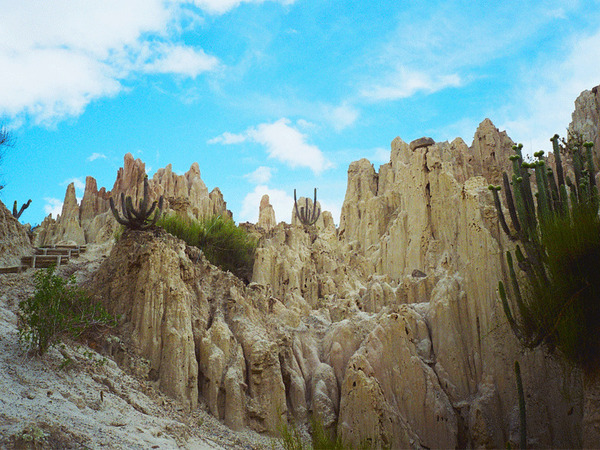 The Montículo, in the bohemian Sopocachi is the classical meeting point of lovers and newlyweds for romantic pictures. Since 2014 La Paz is proud of its new gondolas. From the sky the panorama over the city and the mountains is unique and we can get an impression of the social gaps while flying over different neighborhood. We will then drive to the south, cross the rich "Zona Sur" and get out of the city to enter the Moon Valley. Here we can enjoy the quietness and walk among the lunar rock formations during an hour. In the afternoon we will go back to the historical center and wander along its colorful markets. NOTE: The K’Illi K’Illi mirador and the Laykakota Park are closed on Mondays. Departure from the hotel in our private vehicle for a trip to the archaeological site of Tiwanaku (1h30). 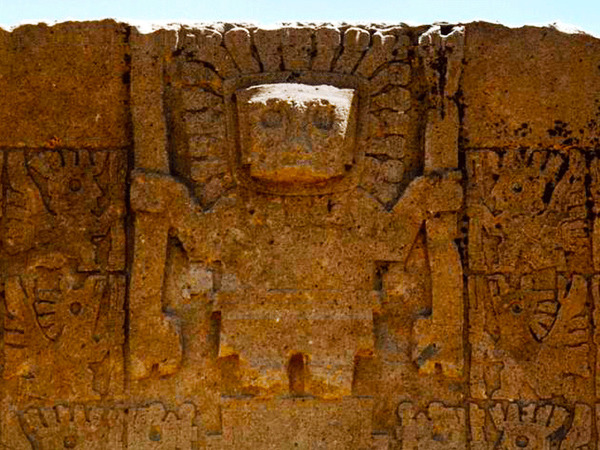 Guided tour of the pre-Colombian ruins considered as the most important of the continent. 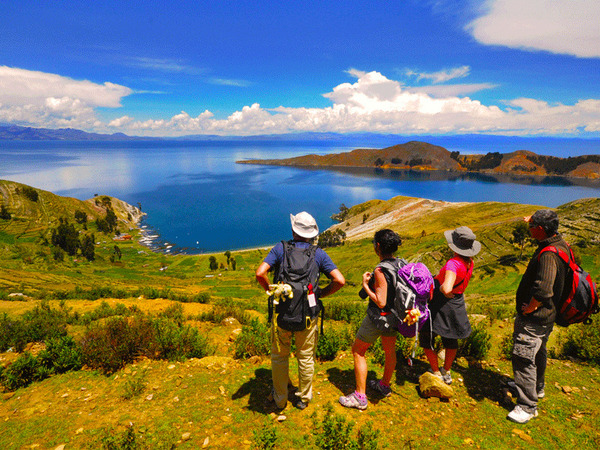 We will then drive along the shores of the Lake Titicaca and the Cordillera Real to Copacabana. Night at La Cúpula hotel***. HERE STARTS YOUR TRIP ON THE FAMOUS SACRED LAKE! Later on we reach the village of Yampupata. A boat takes us to the Isla del Sol (Island of the Sun), where we disembark at the old Inca Palace of Pilkokaina. 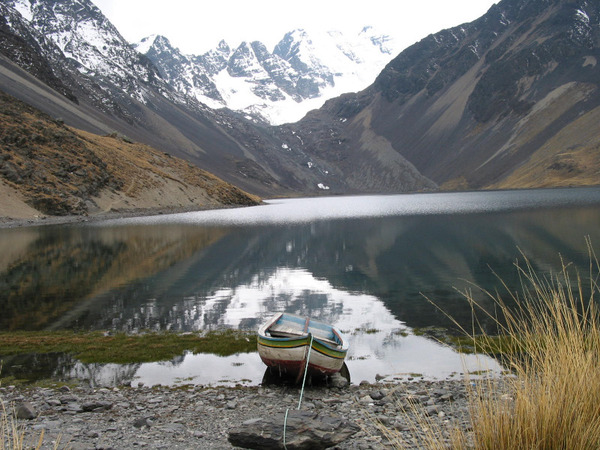 A 30 to 40-minute walk brings us to the village of Yumani, from where there is a magnificent view of the lake. 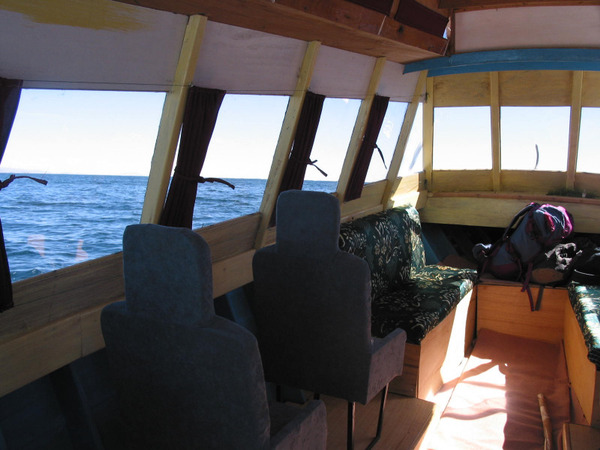 Note: During 2 days, a boat will be at our disposal to transport the group as well as the bags during the walks. Night at the Puerta del Sol hotel*. 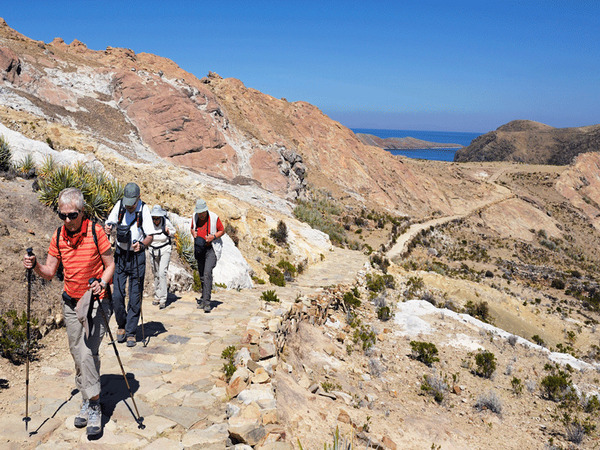 From Yumani, we start the trek by following the crest of the Island to the North where we find the vestiges of the Inca ruins of Chincana, the labyrinth in Aymara (3 to 4-hour walk). Our boat takes us back to Copacabana after lunch. 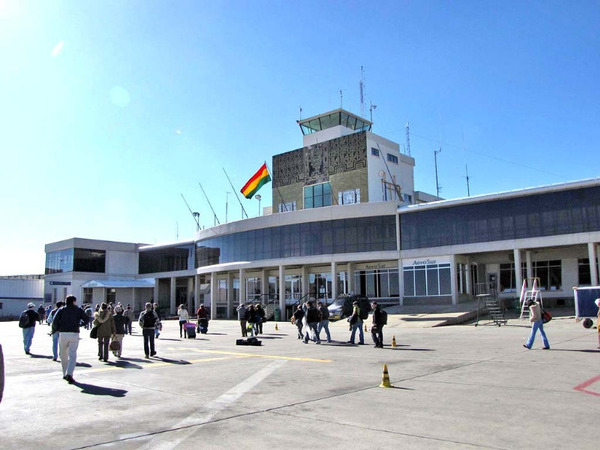 We will return to La Paz in private transportation (about 3½-hour). We leave in the morning to Tuni, a small village in the Royal Cordillera, beautifull mountain range rising to 6400 m.a.s.l which makes the barrier between the Amazon and the Altiplano. Difficulty: 4 to 6-hour hike a day. Good fitness required. Departure from La Paz at 8 a.m. by private vehicle to go to the village of Tuni, the starting point of our trek (a 3-hour trip). After getting around the lake of the same name, we will pass a saddle at 4900 meters above sea level, before descending to the Laguna Juri Khota (a 4-hour walk). 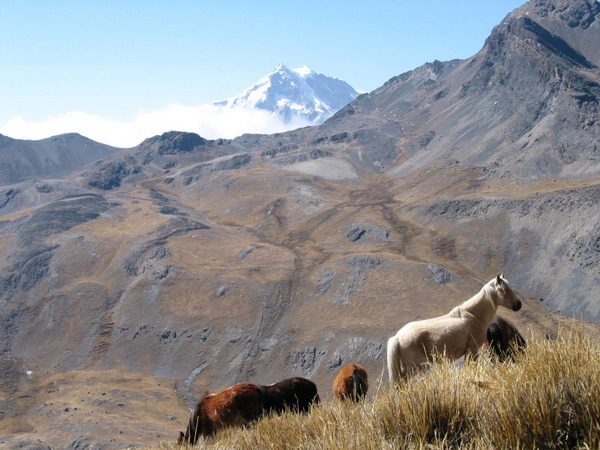 From there we will have a very beautiful view of the “Cabeza de Condor”, or the Condor’s Head also known as El Condoriri, dominating the scenery (el.5648 m.a.s.l.). 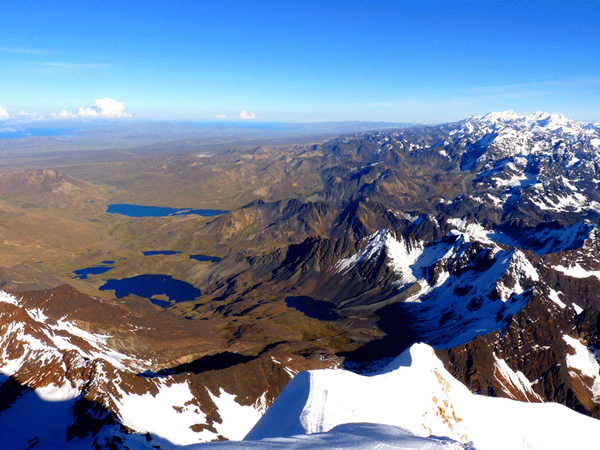 With the two adjacent summits, the Condoriri range, it has the shape of a condor with tucked wings. Ascent time: 4h; Elevation gain: +500m / -250m. 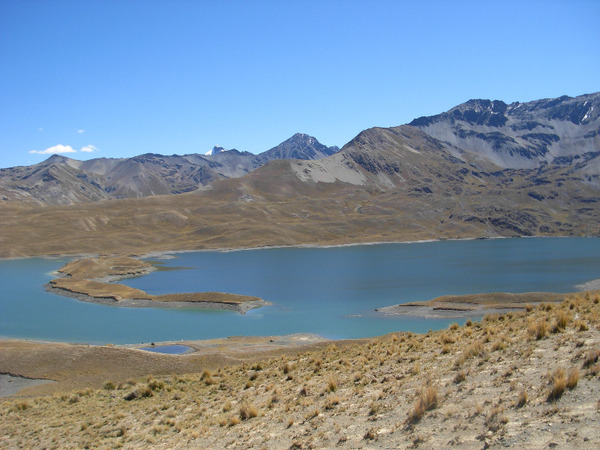 From the Laguna Jurikhota we will climb up a steep slope to reach the Laguna Congelada, (two glaciers drop into its icy water), a stunning sight at an altitude of 4900 meters and at the base of the El Condoriri (el. 5650 m.a.s.l.). After climbing to a second saddle (Paso Austria, 5120 m.a.s.l. 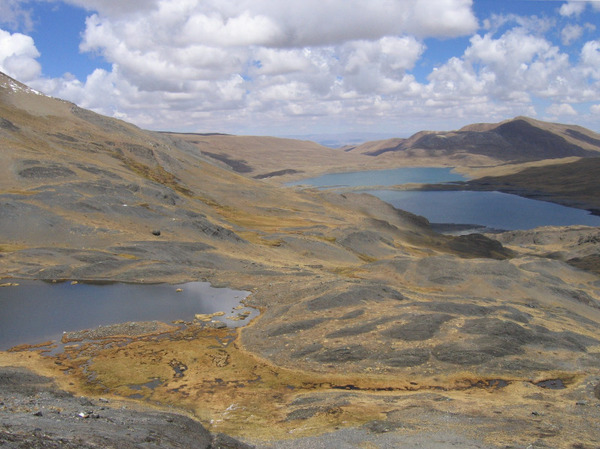 / one hour ascent) we will descent on the other side towards the El Condoriri and the El Pequeño Alpamayo base camp, at the edge of the Laguna Chiarkhota (el. 4670 m.a.s.l. / 1h30 descent). Hiking time: 6h; Elevation gain: +645m / -670m. Leaving the Condoriri behind us we will pass at the base of the Black Needle and eventually reach the Jallayko Pass (el. 5025 m.a.s.l.). We will then descend into the very beautiful and steep Jistaña Valley, before ascending the Tillipata Pass (el. 5000 m.a.s.l.). The spectacular scenery over the myriad of lagoons will be a great reward for our efforts. After another downhill to the Laguna Wichu Khota, where we will set up our camp, at the base of the María Lloco (el. 5522 m.a.s.l.). Superb walk amongst the lakes, until the old camp for the Santa Fe mine. Short detour to a small summit dominating the camp for a nice view over all the lakes. 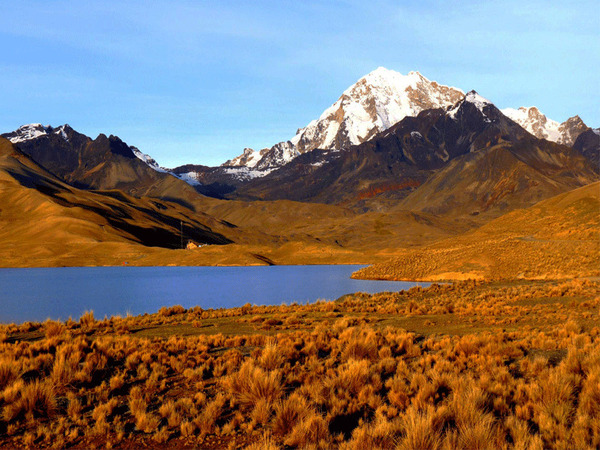 We will then climb up to the camp, surrounded by the summits of the Imilla Apachita, the Maria Lloco and the Huayna Potosi (el. 6088 m.a.s.l.). The view is just superb (4/5-walk). 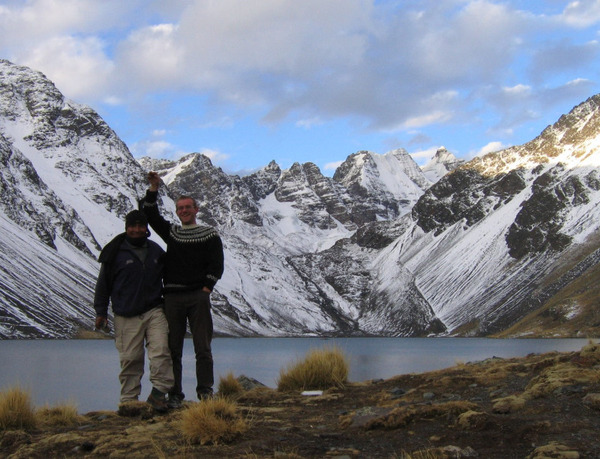 The bravest can hike to the Laguna Glacial del Huayna Potosi. A wonderful scenery can be enjoyed from this track which is a former stone channel (2h round trip). Meet at 06:30am (place to be confirmed, Madness). A vehicle will take us to the Cordillera Real. After passing the Cumbre (4750m el.) the Andes seem to drop down. The Amazonian basin is just a hundred kilometers further on a straight line! 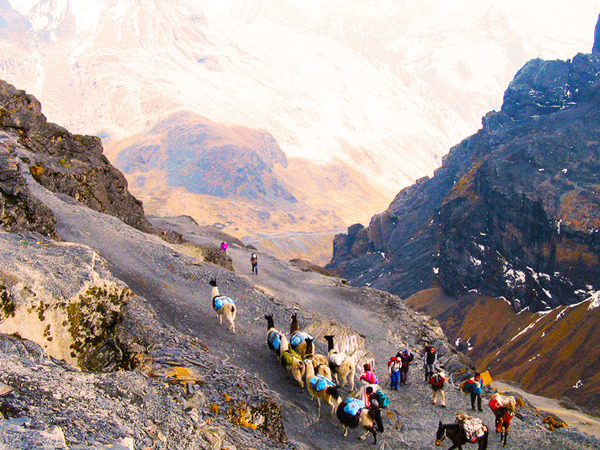 Welcome to the Yungas, an amazing intermediate area, with the name of the old pre Inca people leaving on the steep slopes. 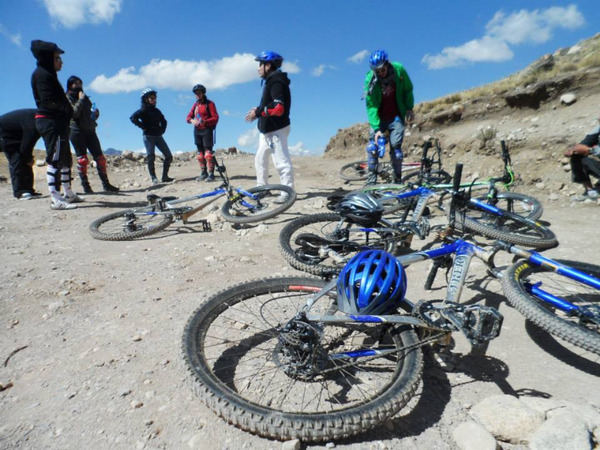 The thrilling descent starts from the Cumbre at 4750m. From a turn to another the landscapes become greener, the aire wetter and the wind warmer... it will be a 3500 elevation lost to Yolosa (1100 el.) in just a few hours! We will take a vehicle to climb the steep 7 kilometers (650m elevation gain) to Coroico, a wonderful village of the Yungas where we will enjoy a tasty buffet. Transfer by 4WD to the Ecolodge of "Las Cascadas" down in the Rio Coroico valley in the direction of Caranavi. 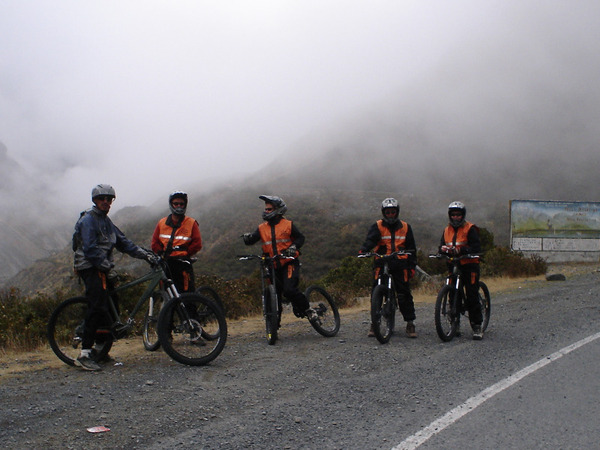 Note: the mountain bike descent is a group service / english speaking guide. 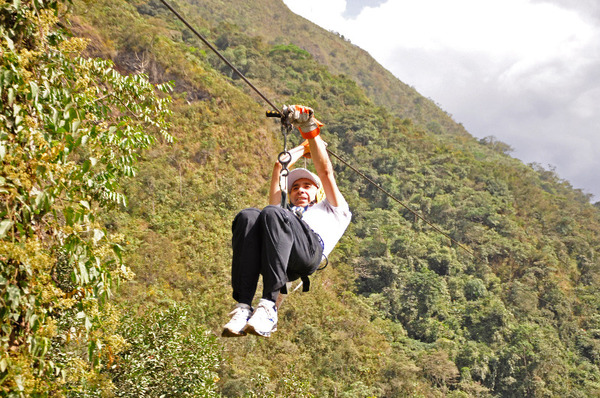 Allow for 25 bolivianos per person for the "Death road" access fee, which is to pay before the descent. We will walk down to the Rio Coroico to get to the kayaks and rafts (your choice). 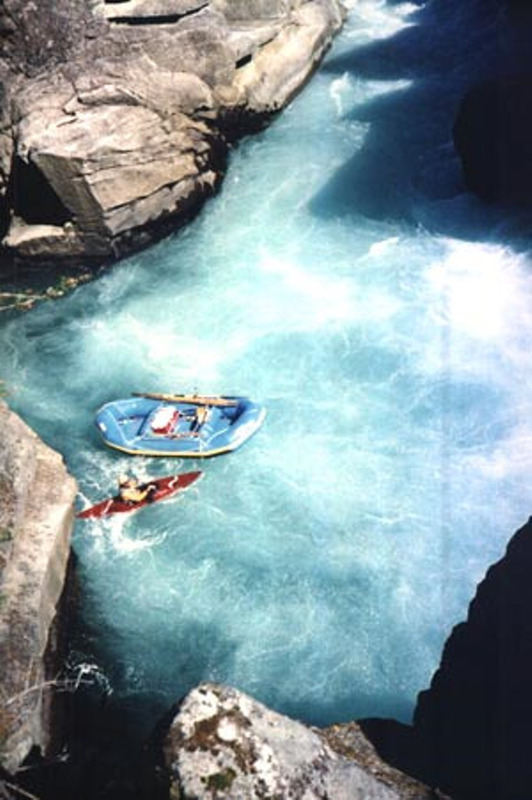 We will start the descent in a tropical environment, following the river for 2 to 3 hours. Arrival to Chojña from where we will return by vehicle to the lodge for lunch. Stp on the way to the wonderful waterfall of "Ensueño", the charming. Note: bring a pair of sneakers or light water shoes and extra clothes. The refting option is available for a minimum of 4 people. Wonderful walk along the river. We will pass superb waterfalls where we can relax and swim. We will cross the valley by a cable at 200 m height. Guarantied thrill for the 500m slide! 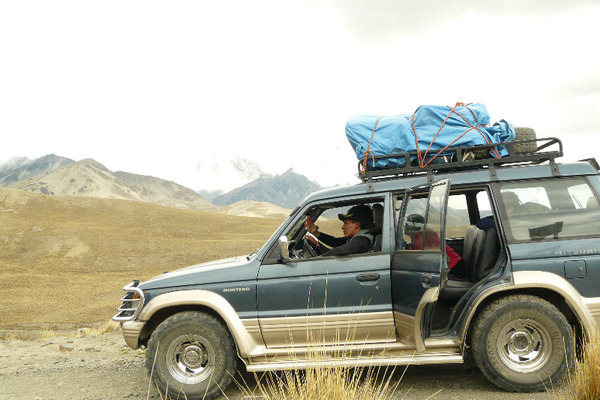 Return to La Paz in the afternoon by private vehicle. Note; bring a pair of sneakers or light water shoes and extra clothes. A private driver will pick you up at your hotel and take you to the airport. 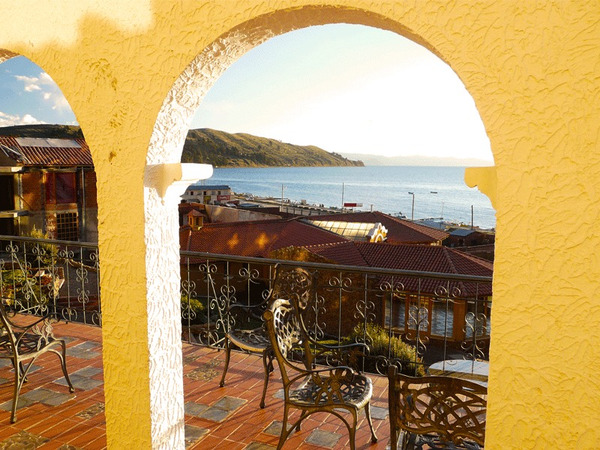 La Cúpula is nestled on the hillside of lake Titicaca, a location, which overlooks both the lake and the Village of Copacabana in Bolivia. La Cupula lies 3,899 meters over sealevel. The hostal has a touch of arabic architecture with colonial and precolombian elements, giving it an unique and an unforgettable feeling. 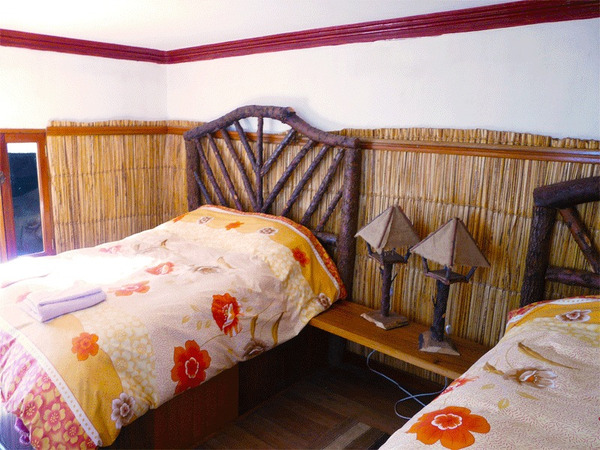 Each of the 17 comfortable and clean rooms are individually designed, with a variety of artistic details. 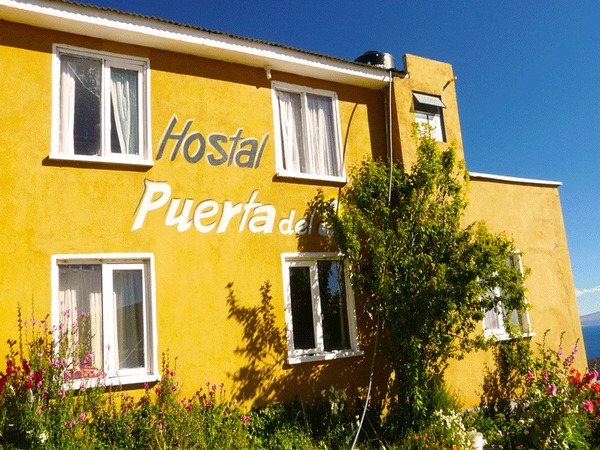 Hostal Puerta del Sol offers unmatched views of both sides of the lake from its top position. The hostel itself is nothing spectacular, but cheap rooms. It's a quite place with great access to walks around the island.